Like many restaurant chains, this client needed to focus their analysis on meeting sales targets. They sought a visual tool that would help them evaluate performance versus targets at several different levels: by product, by market, by state. Trending sales was also important to them to evaluate fluctuations in sales over time. 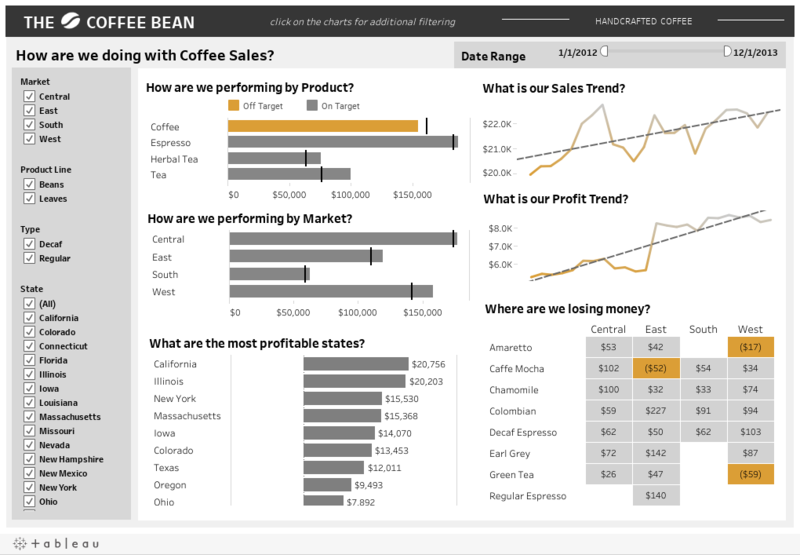 To address the client’s most important question, we designed this dashboard to focus on the actual versus target sales. As requested, the design allows the client to easily identify products, markets, and states that are missing their sales targets. We also included a trend for not only sales but profit, which allows the client to better understand the relationship between the two.